For something fresh and easy, give this refreshing Tomato Flower Salad a try. Arrange sliced tomatoes in a flower shape on a serving plate. Arrange torn basil leaves among sliced tomatoes. 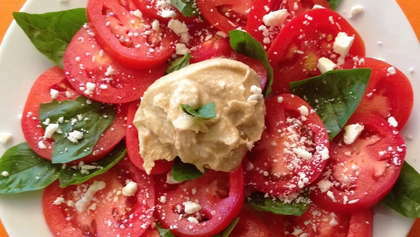 Place a dollop of hummus in center of tomatoes and top with a small basil leaf. Sprinkle crumbled feta cheese on tomato slices.